The quoted rate includes accommodation, 10% service charge, and a “Stay2Day” ticket valid for 2 days of unlimited access to Hong Kong Disneyland. Families with children can purchase additional park tickets for HKD288 (USD36) for children aged 3 – 11. This promotion cannot be combined with any other offer. Located right beside the park, the Hollywood Hotel and Disneyland Hotel are the perfect base for your family holiday. Garden View rooms are comfortably furnished with a king sized bed, LCD TV, mini-bar, spacious bathroom, electronic safe, and special Disney-themed amenities. 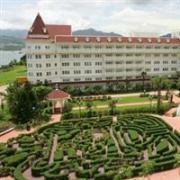 The hotels have family-friendly restaurants, swimming pools, kids’ activities, and even a Mickey garden maze. Visit the Hong Kong Disneyland website for more information. Bookings can be made online or by calling the Reservations Center at (852) 1 830 830.